This selection of great quality and robust activity wall panels provides the opportunity to develop motor skills and hand-eye coordination whilst encouraging learning through collaborative and imaginative play, reasoning and language as well as developing the awareness of time, shape and space. 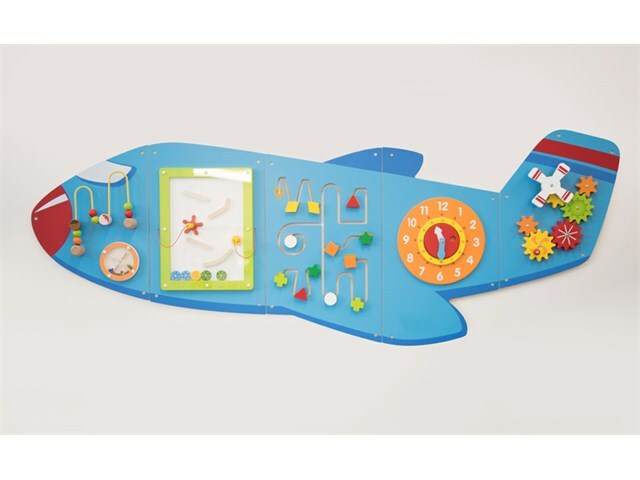 The Aeroplane activity wall panel is made in five pieces, each with a different set of manipulative activities to encourage hand-eye coordination and fine motor skills including: a clock with moving hands, wire bead maze, magnetic pens, shape maze and interlocking gears. It is supplied fully assembled with fixing holes and attachment screws for easy fitting to a wall. Dimensions: Aeroplane 180cm x 60cm x 50cm. 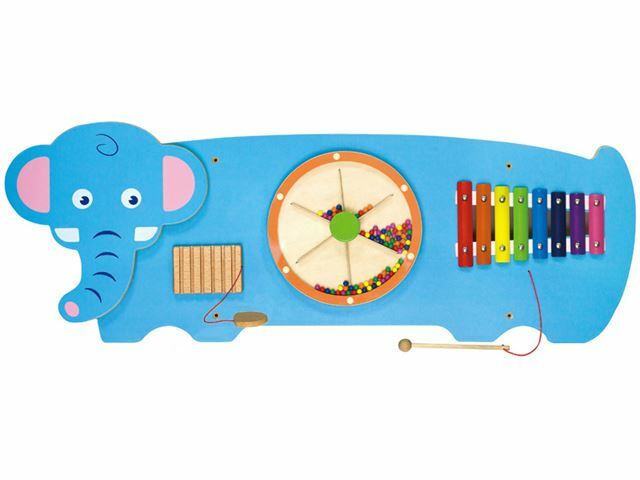 The Elephant activity wall panel is visually captivating and provides a range of interesting manipulative activities for a single user or group of users playing and exploring together. Provides the opportunity for play as well as the development of hand-eye coordination, finger control and fine motor skills. Includes fixing screws for easy fitting to a wall. Dimensions: Elephant size 91cm x 32cm x 4.5cm. 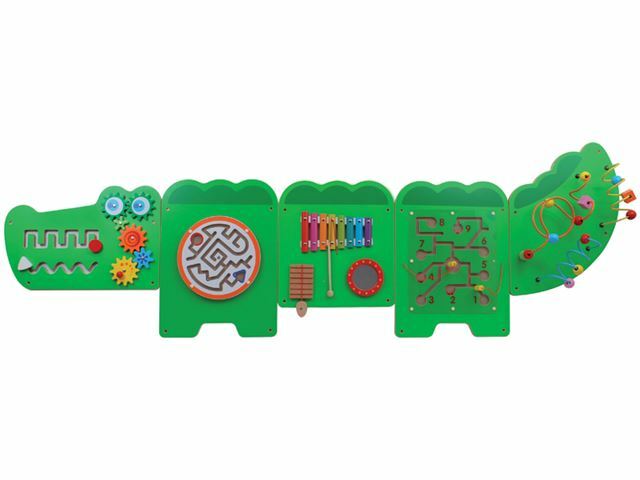 The Crocodile activity wall panel is designed to look like a friendly crocodile that will attract interest and admiration wherever he is seen. Made in five pieces, each with a different set of manipulative activities to encourage hand-eye coordination and fine motor skills including: percussive instruments, a mirror, magnetic pen and ball followers, various mazes and threading activities, rotational pieces and a slotted line followers and interlocking cogs. It offers a range of hands-on problem solving learning opportunities for the development of fine motor skills whilst engaging users in conversations about what they are doing. Supplied fully assembled in five pieces, each with fixing holes and attachment screws for easy fitting to a wall. Dimensions: Crocodile total length 174.5cm. Section lengths: head 3.6cm, front legs 34.7cm. middle 34.7cm, hind legs 34.7cm, tail 34.4cm. This wonderful and colourful set of 3 activity wall panels aims to engage users in cross-curricular learning through play. 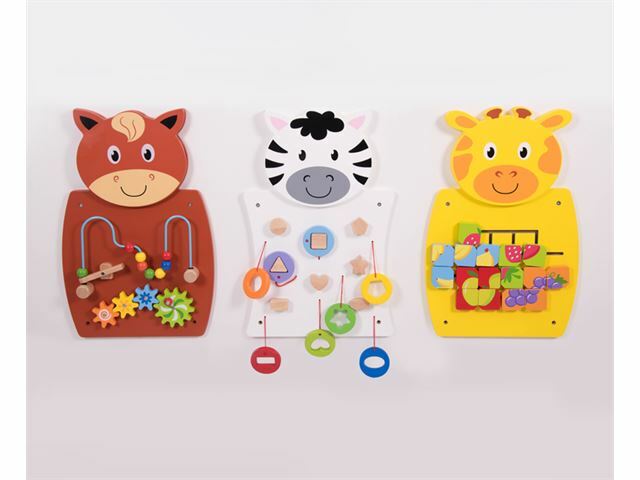 The panels are styled as a brown horse with wire beads and moving gears, a yellow giraffe with fruit puzzle blocks to mix and complete, and a black and white zebra with colourful shapes to identify and match. Includes fixing screws for easy fitting to a wall. Dimensions: Horse, Zebra & Giraffe size of each panel: 36cm x 55cm x 35cm. There are no reviews for this product at the moment. Be the first to review this item by clicking here. Data is at the heart of everything we do. It’s what allows us to create bespoke, accessible online services for your learners. For that reason, we take protecting your data very seriously.